The River Cottage Diaries: Ooops! Mwah ha ha ha! Typical Fox news. Monkeys in the typing pool again. Or was it wishful thinking! Steve, I wonder if heads will roll? Alienne, I wondered that myself. Maybe a Tea Partier in the ranks? Sarah, and it was apparently 'buried at sea'. Let's hope it doesn't wash up anywhere! 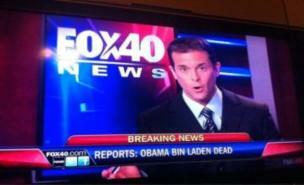 Knowing the sensibilities of Fox it was likely intentional.